With surging interest in European real-estate as an asset class, most of continental Europe is experiencing unprecedented change throughout the whole banking, financial and real-estate sectors. These changes are giving rise to whole new opportunities for smart and well-informed investors. Real Estate Finance Intelligence Report Europe (REFIRE) was set up to meet this rising demand for insightful, reliable information on this asset class, and to help investors pinpoint the areas of greatest opportunity. Our growing readership base includes pension funds, asset managers, US and global institutional real-estate investors, global REITs and similarly-listed vehicles, private investors, corporate treasurers, lawyers, public administrators, banks and other financial professionals, academics, traders, and many others. 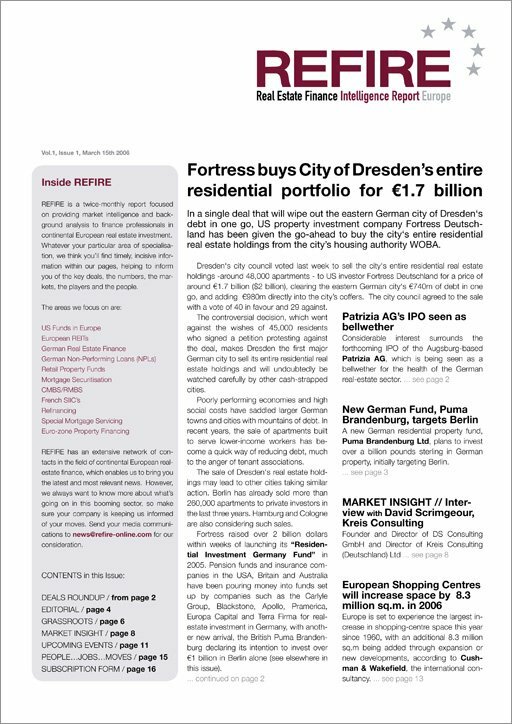 In short, if you want to stay up-to-date with the sweeping changes affecting real-estate investment in Germany and continental Europe, take a closer look at REFIRE and avail of our no-obligation free trial subscription. The focus of our editorial content is Germany and German-speaking Europe. We concentrate on the continent and the enlarged European Union because this is where we know the markets most intimately. And this is where to find the best opportunities to make top real estate returns. We cover Germany extensively, for a number of compelling reasons. While Germany has been a noted underperformer in real-estate over the last decade, all sectors of the German real estate market are now attracting serious investor attention. Whether it's the financing of residential property, logistics facilities, infrastructure, office buildings, or other commercial and industrial property, the level of investor interest is enormous, and growing. Investors clearly believe that the bottom of the cycle has been reached. Look at a past issue of REFIRE here.